It goes by many names: weed, pot, grass, or cannabis, but whatever you want to call it, recreational marijuana is poised to be legalized in Canada later this year on October 17. What does pot legalization mean for you? The Cannabis Act, known as Bill C-45 is now law. "Parliament has now passed Bill C-45, which will legalize and regulate access to cannabis. We will soon have a new system in place, one that keeps cannabis out of the hands of our kids and keeps profits out of the hands of organized crime," - ..
two profiles were found for Castpodder.net in social networks. Among other social networks the website is represented in Facebook and Twitter. 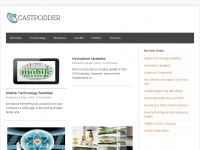 The web server used by Castpodder.net is run by EBL Global Networks and is located in Dallas, USA. On this web server 24 other websites are hosted. The language of those websites is mostly english. The Castpodder.net websites were developed using the programming language PHP and served by a Apache server. For managing the data of the webpages the CMS WordPress in the version 4.9.7 is used. The website uses the latest markup standard HTML 5. The website does not specify details about the inclusion of its content in search engines. For this reason the content will be included by search engines.